Yorit Tal was born in Israel. She believes she was born an artist. From a young age, she pursued dancing, and at 14, she was approached by the most well-known choreographer in Israel and asked to dance professionally. She danced in numerous TV shows, movies, and performed jazz and ballet at the Israeli Opera. By age 16, she was teaching at well-known studios in Tel Aviv and choreographing for different theatrical shows. 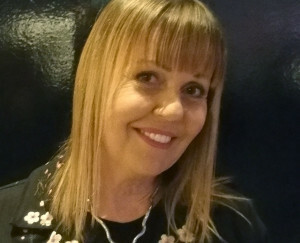 She met her husband, Doron, more than 36 years ago in Tel Aviv, and married him within three months. They honeymooned in New York, and by whim, decided to come to California where they have remained for more than three decades, raising a daughter and a son and building their dream life together. Neither a therapist nor a professional coach, Yorit writes this book straight from her heart, out of her fully lived experiences. Today, she and Doron live on a scenic ranch that they renovated, located high on a bluff overlooking Topanga Canyon in the Santa Monica Mountains. The property, Oak Creek Ranch (OCR), is their paradise on earth, from where Yorit sculpts, paints, and offers workshops and retreats for individuals and couples on how to create lasting love and build a dream life together. I am not a therapist, certified life coach, or marriage counselor. I am an astonishingly happy woman who has been married to the same man for more than 36 years—and together, over these decades, we have built a wonderful life, family, home, and retreat/workshop center together. My journey to write this book grew out of the increasing number of times that I was asked by friends and acquaintances how my husband Doron and I came to be so happy and successful, sharing so much love and harmony for all these decades. Couples we met were curious about what strategy Doron and I had used to achieve all that we have in our decades in the US. Little by little, I began to feel that it would be both fun and challenging to try to identify and describe the philosophy that Doron and I share that has helped us build our dream life together. I am confident our journey through our lives will prove to be inspiring and fruitful for other couples. When I began thinking about my book, I was very uncertain how to put the chapters together. Working with my editor, I realized that I had 7 distinct ideas that, in my mind, are the true keys to creating a deeply loving and successful relationship. I had already spent many years thinking about what makes couples happy, what holds them together, and how they can co-create an amazing life for themselves and their families. I also read other books on the topic and took a few workshops, but the fundamental concepts of strong partnership that I developed came from my own personal life experience. I had also advised some couples who are close friends of ours and who asked me how Doron and I have managed to stay in love, with so much respect, joy, happiness, without conflict, and achieve so much in our lives in a short time. Throughout my life, I have always been attracted to and loved nature, especially trees. One day, it dawned on me that an oak tree is highly symbolic of a couple’s love for each other. A loving partnership is one that breathes fresh air into the partners day after day. Its foundation is like the moist nutrient-rich soil that allows the couple to grow their dreams together and harvest them whenever they want. And most of all, as the two of them live together for decades, they become like that venerable oak tree, planting their roots deep into the ground to sustain them year after year. 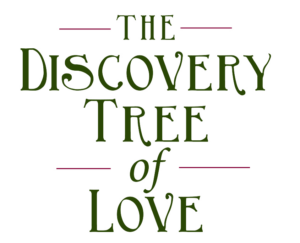 I decided to call my book The Discovery Tree of Love, as climbing its 7 branches represents how couples can attain a sturdy, lasting, solid partnership in life. 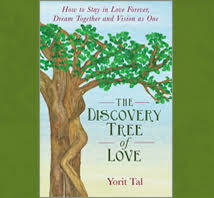 This tree is a symbol for all of the concepts in my book, and I am excited to offer it to any couple who wants to take this journey with me to build the life they want and to imagine and accomplish amazing new dreams together!